This book is a second phase in the series. It starts 6 wks after City of Glass. But there are different stories being told, and the focus isn't soley on Clary and Jace. I would say this is Simon's story. He is learning to be a vampire, and also trying to live a normal life. Which is hard to do and causing a lot of problems. Clary and Jace are still here and are having their own relationship struggles. I'll say this wasn't my favorite in the series at all, but it was still good. I almost feel like if you are going to resurrect a series to have another 3 books, you'd better have a good reason. I'm hoping the next 2 books, yet to be released, will be much better. I thought there was so much going on here, too many different stories. I wasn't glued to this as I was the other books in the series. 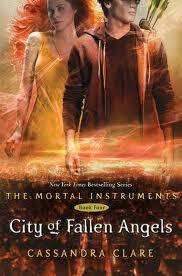 But I still love anything that has to do with Jace and Clary, so I loved all their interaction in this book. It was still good, but not the best. "When did you two get so buddy-buddy? Last night, it was all, 'I'm the most elite warrior! ', 'No, I'm the most elite warrior!' And today you're playing Halo and giving each other props for good ideas." "We realized we have something in common," said Jace. "You annoy us both." You know what bothered me about this book? It's very existance. It was supposed to be a trilogy and nothing more. But of course with the sales and popularity of the series she went and made another one in the series....how goofy and dumb is that. Should've just left it as is eh? I totally agree. There should have been a good reason for her to start the series up, but there wasn't. She shouldn't have messed with perfection. If she wanted to start a separate series with Simon as the narrator then she should have done that. But, there were too many stories being told at once. Nothing concrete happened really, it was all left open. I don't like that. I'm hoping the next 2 books are good, but I can't say I'm very hopeful. Spot on, woman, spot on! !